Long View Gallery is pleased to announce RYAN MCCOY :: PAINTINGS, an exhibition by Ryan McCoy, opening on Thursday, September 19, with a public reception from 6:30-8:00pm. The exhibit will be on view through October 20, 2013. In RYAN MCCOY :: PAINTINGS, McCoy presents a new body of work where he attempts to structure meaning through specific materials to create a personal iconography about time, place, and memory. 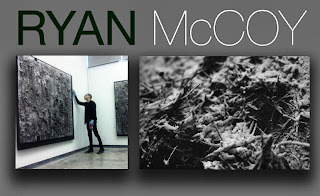 McCoy’s work has been exhibited nationally and internationally, and is included in collections on four continents. McCoy earned his MFA and BFA from George Mason University and teaches at various schools in the DC metro area. We have recently been contacted by someone called Sophie Dare who is claiming to want to acquire a lot of works by Saatchi Online artists. I have subsequently discovered that she is contacting artists directly and asking to buy multiple works from them and offering all kinds of incentives. We have heard that one artist (not from Saatchi Online) sent her many works a while ago as part of an agreement and never got paid. So we would strongly advise not to respond to any emails from this person. We are very sorry about this and are trying to be as vigilant as possible with cases like this in order to protect Saatchi Online artists.